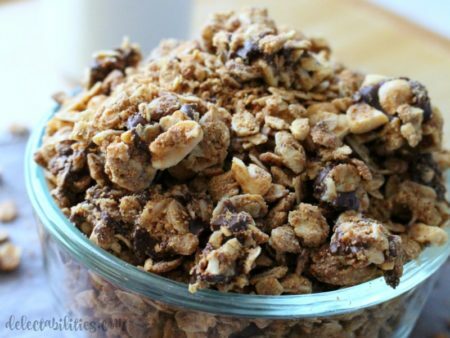 This Pumpkin Pecan Granola is something that I’ve been wanting to make for a long time. I really just needed to wait until it was socially acceptable to make pumpkin flavored things. It turned out much better than even I expected. I love all things fall, especially pumpkin flavor. And I also love granola. As evidenced with these other recipes here and here (my husband’s favorite). I’m so glad that I was able to find a way to combine the two. I started with just regular old fashioned oats. 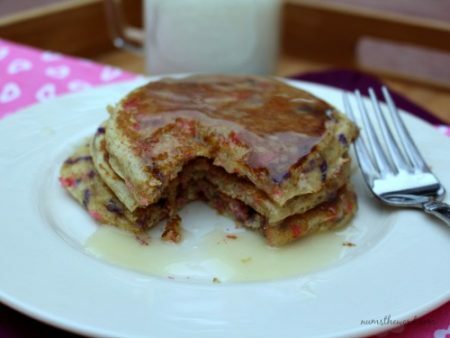 Make sure if you’re trying to make this gluten free that you use oats that are gluten free. I then added some more goodness with chopped pecans and some ground flax seed. 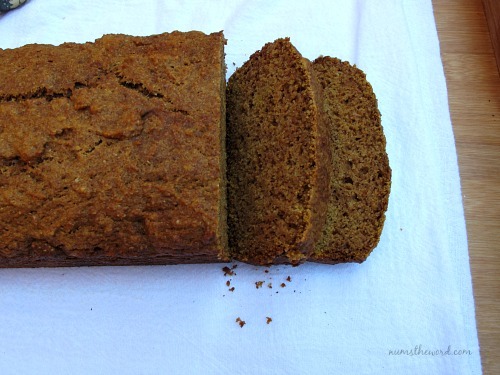 I rounded it out with all the spices that make fall amazing, particularly lots of cinnamon. In my attempt to make this granola relatively healthy, I decided to use coconut oil and also pure maple syrup to sweeten it with. That seemed like the natural choice with these flavors, but it’s also much lower on the glycemic index than other sweeteners. 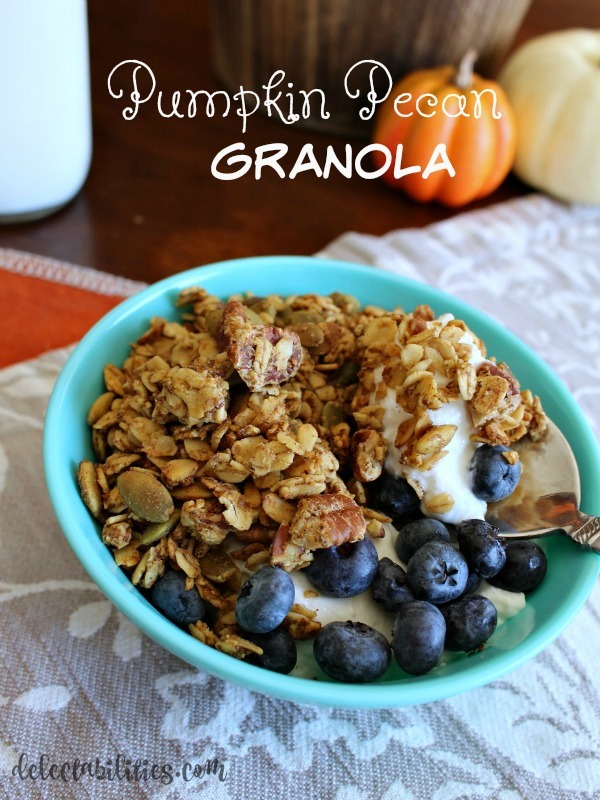 This pumpkin pecan granola is perfect with some milk, but especially good with some vanilla yogurt and fresh blueberries. Now, that’s a pretty darn good breakfast right there. Preheat oven to 350 degrees. Prepare a baking sheet by lining with parchment paper or silicone liner. In a large bowl mix oats, pecans, flax seed, pumpkin seeds and spices until well combined. Mix melted coconut oil, pumpkin puree and maple syrup together in small sauce pan and heat over medium low until coconut oil is melted and everything mixes together. Pour the wet over the dry ingredients and mix together until well distributed. Spread mixture over the prepared baking sheet and bake for 30-35 minutes, stirring every 15 minutes. Allow to cool on the pan before storing in an airtight container. 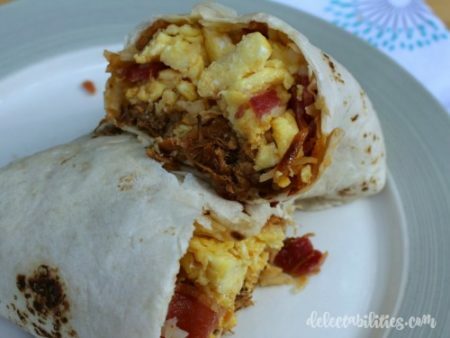 With barbecue beef brisket, bacon, eggs and hash browns this BBQ Bacon Breakfast Burrito is not for the faint of heart! It’s filling and oh-so full of num!